Alaska currently has 21 separate incidents listed in the Inciweb database ranging in size from 104,218 acres down to 212 acres. The satellite image taken by the Moderate Resolution Imaging Spectroradiometer (MODIS) aboard the Aqua satellite on July 05, 2015 shows decidedly more than 21 actively burning areas. Actively burning areas, detected by MODIS's thermal bands, are outlined in red. MODIS' fire detection map for July 06, 2015, however, shows hundreds of fires across the state. According to the legend on the map, though, many of these fires have been detected in the last six hours. 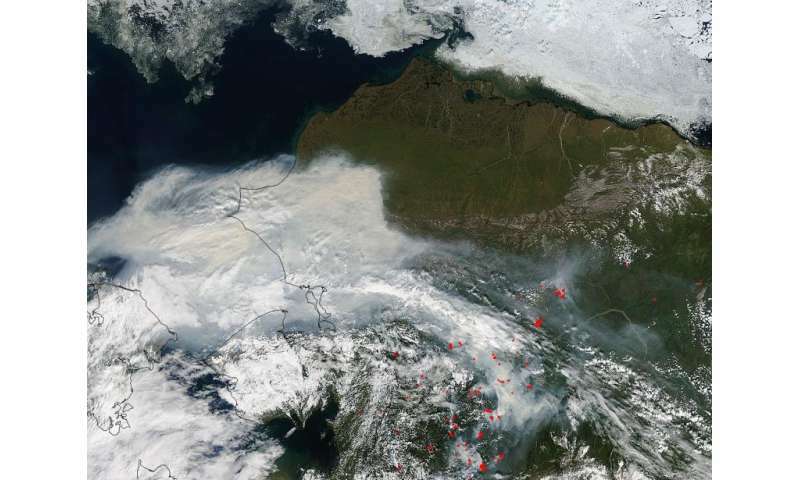 The clouds that cover parts of Alaska to the west are tinged with brown as the smoke rises and mixes with the clouds. And, all that re-released carbon joins the new coal smoke from developing nations. The smoke has been visiting us in the Pacific NW lately, with another round predicted for tomorrow. I've at least taken some satisfaction that I'll have died before the worst hits and the resource wars begin and the "Evergreen State" burns down like the Amazon rain forest is on the brink of doing. But now that's not so certain.